It all began with a few pints in New Zealand. When the Husband and I lived in Christchurch there were about three brewpubs within 15 minutes walk of our house. We could stroll down to the Dux de Lux for their legendary nachos and a glass of Nor’wester or head over the river for pizza and a Golding Bitter at the Twisted Hop. It was a different way of drinking, away from the big, bland brands, most of it matched with very decent food. When I came back to Ireland I could no longer stomach my usual pint. Nor could the Husband and it wasn’t long before he started what was to become an extensive collection of brewing books. Soon after we moved to the cottage, he cut down work to a four-day week and started homebrewing. He was so happy with the results that, before long, we were doing brewery research in Berlin, he got the Aussie – a former housemate – juggling hydrometers and fermenters in Melbourne and had me writing articles on the renaissance of homebrewing. Most exciting of all, he soon had the Aussie convinced that microbrewing was the way to go. With a relocation to Dublin on the cards for the Aussie (not just for beer, there was a cailín involved!) 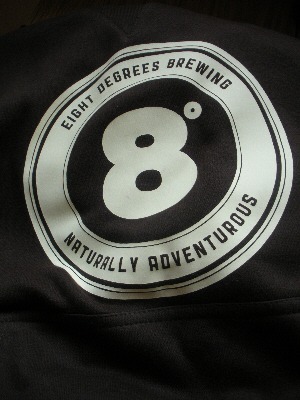 they decided to set up Eight Degrees Brewing. We then had ten days living in Berlin with a six-month-old Little Missy so that the Husband could study brewing at VLB and many, many months of the Aussie sleeping on the floor at the cottage while they plotted, planned and organised. And now it’s here. Despite last minute hitches – me falling down the stairs the night before their planned first brew, moving out of the cottage the day after, equipment malfunctions aplenty – the Husband and the Aussie were able to stand proudly behind their very own Eight Degrees Brewing bar at this year’s Franciscan Well Easter Beerfest and present their first beer, Howling Gale Ale. It was very much down to the wire: only on Thursday afternoon did the men from NZ and Australia say ‘yes’. 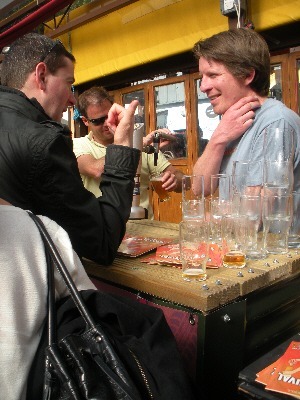 But we got plenty of punters saying the same thing – and putting their hands in their pockets to reinforce the point. Howling Gale Ale has now been officially launched on the world at our most local beerfest, we’re off to Galway for Brewers on the Bay next weekend and Bloom in the Park is coming up over the June Bank Holiday weekend. I think the next few months are going to make 2011 a beer summer to remember. Best of luck to 8 degrees et al! Love the logo! Thanks Joanne. We certainly breathed more than a few sighs of relief over the weekend! We’re thrilled with the logo too – brilliantly designed by The Green Man Studio in Cobh. Sounds good , where are you going to sell it ? Everywhere we can, Martin! The lads are still working on getting the bottling line up and running but things are going to get really interesting when that’s going. Thats sounds so exciting! Can’t wait to taste it. Congrats to all involved. Thanks Roisin – it’s been a long, long road! Do you remember me giving out about the Husband making homebrew when we were in Urru?! Great news, def a market for this! Best of luck with it. Times have really changed – for the best! From the dearth of drinkable beer when we came back from NZ in 2008 to the great range of microbreweries about at the moment, it’s good to see such an appreciation for what we’re all trying to do. Thanks Angela – when it gets into bottles I’ll have to bring you a few samples!